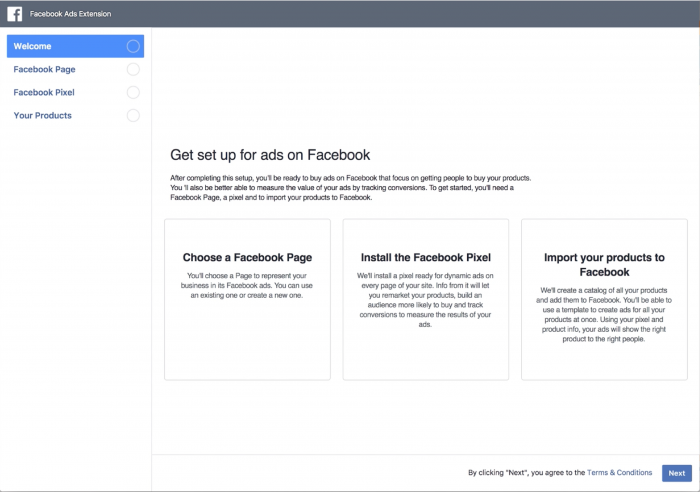 Advertisers can do some amazing things with Facebook ads, largely thanks to the Facebook pixel. The problem for many e-commerce brands, however, is that utilizing the “good stuff” has required some technical dirty work that often confuses and intimidates those without technical resources. Thanks to a new integration with WooCommerce that started rolling out on Tuesday, this suddenly becomes much easier to do for many e-commerce brands. 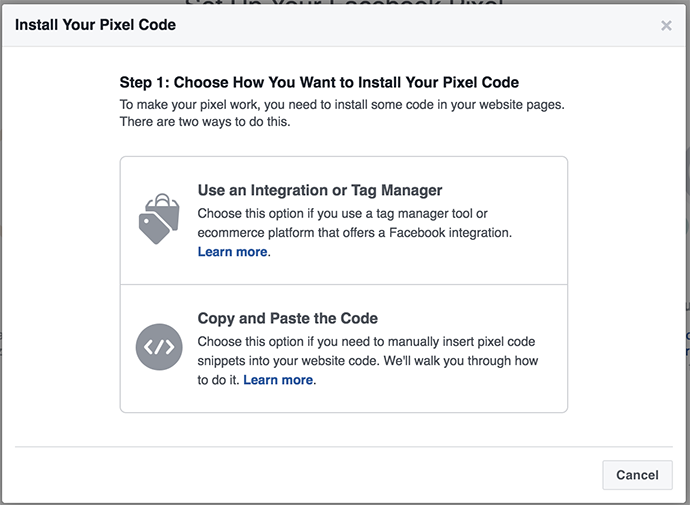 The Facebook Pixel: The pixel is a single snippet of code unique to your ad account that you would add to every page of your website. There are many different ways to add that pixel, depending upon how your website is set up. 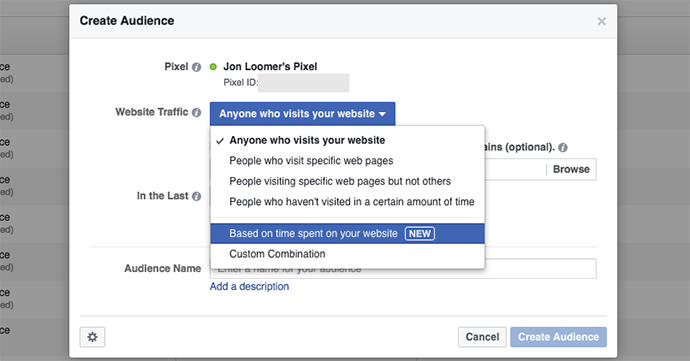 Audiences: Once the pixel is added to your website, you can create many different Website Custom Audiences for Facebook ad targeting. Create audiences of people who visited a specific page or visited more often, for example. Then create ads that are hyper-targeted based on that behavior. Events: In the case of an e-commerce site, you can also create events based on a user’s specific behavior. For example, custom code added with the pixel on certain pages will signify a standard event (add to cart, registration or purchase, for example) or custom event. Product Feeds: E-commerce websites using the Facebook pixel can also generate product feeds that can be used in dynamic ads and collections ads. Once Facebook has a feed of products from your website, you can populate ads dynamically with product name, price, description, image and more from that feed. This all sounds great, but the problem has been the technical expertise needed to execute all of these things. Simply getting the pixel added in the first place can be a chore for those who aren’t technical. But customizing with events and generating a product feed add a whole new level of complexity that most aren’t willing or able to take on. 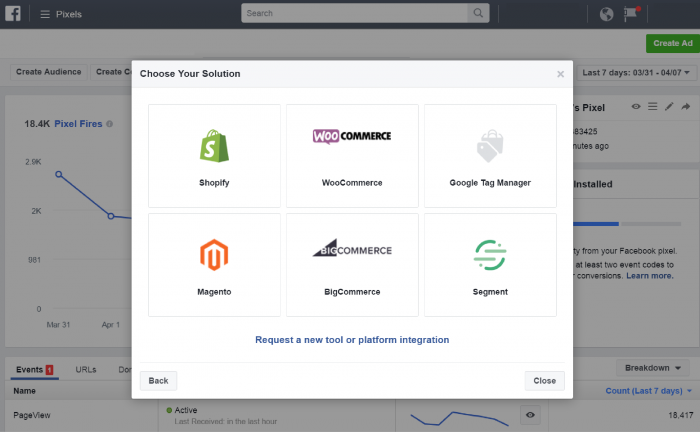 Facebook provided integrations for Magento, Shopify, BigCommerce and Segment in the past. And now that integration is also available for business websites using WooCommerce. That problem is solved, thanks to the Facebook for WooCommerce extension. When setting up your pixel, you have the option of copy and paste or integration. After this roll-out, there will now be six different integration options (Shopify, WooCommerce, Google Tag Manager, Magento, BigCommerce, and Segment). 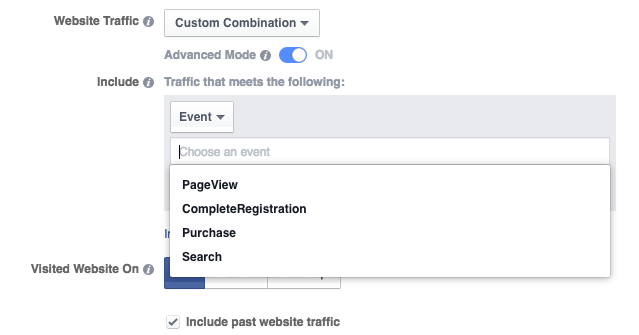 If you use WooCommerce, you will need the Facebook for WooCommerce extension to implement this integration. 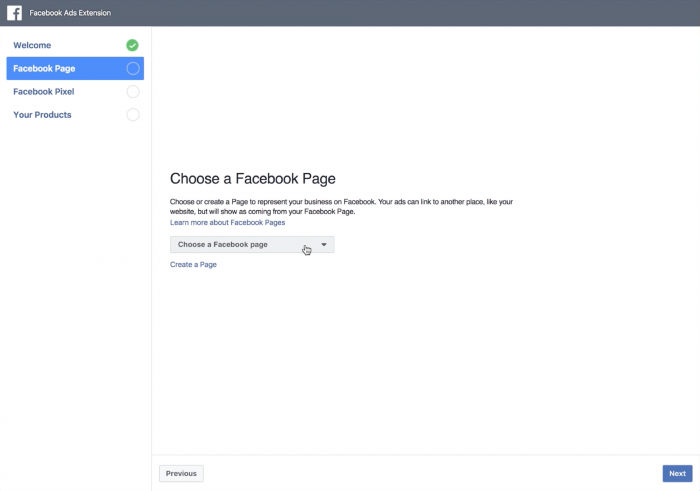 First, select the Facebook page that will be related to this website. 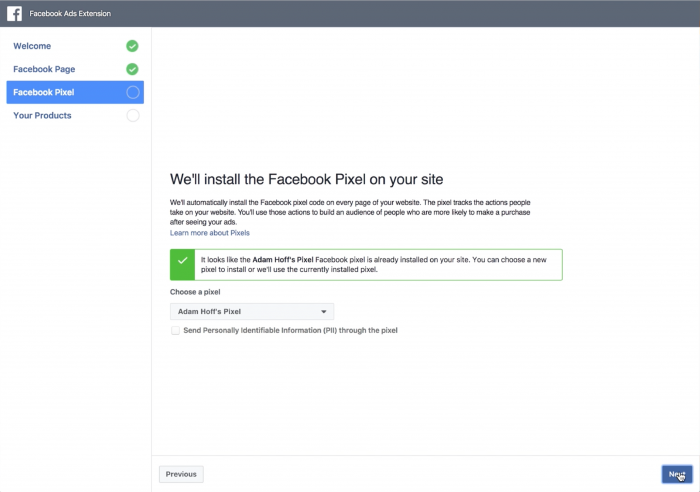 Then select your Facebook pixel, and Facebook will automatically add it to every page of your website. The proper events will also be added. 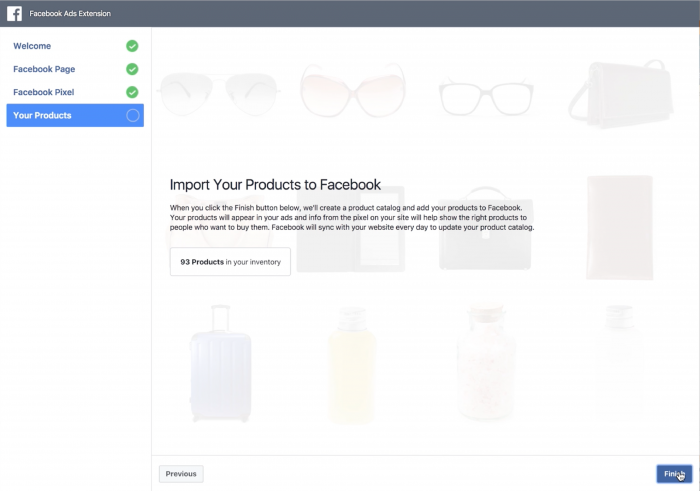 Facebook also auto-generates your product feed for you based on the products you created within your WooCommere set-up. 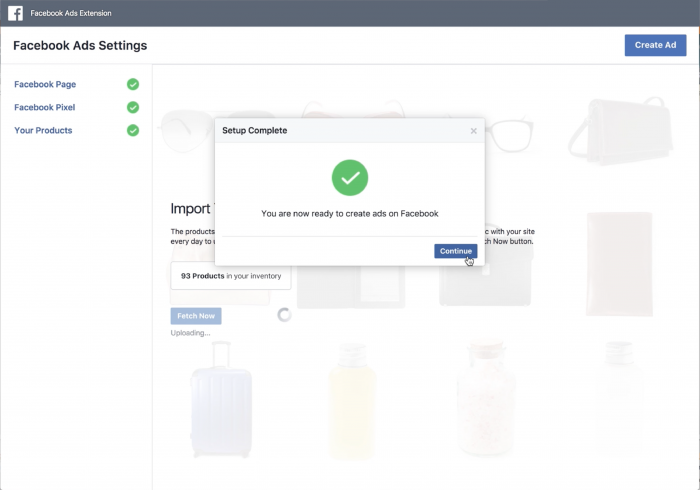 Facebook will tell you how many products you have in your inventory. 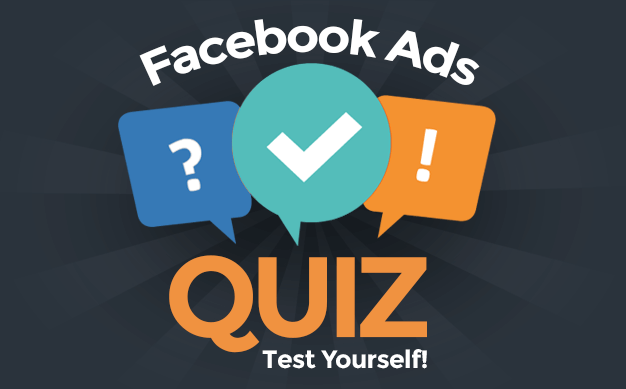 Once you click “Finish,” your feed will be available for Facebook ads — notably for dynamic ads and collections. 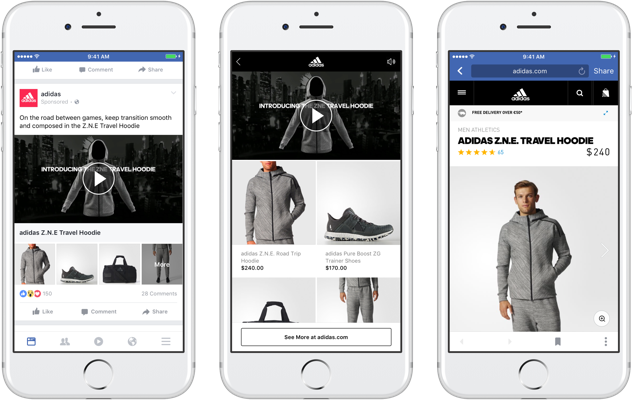 Thanks to this update, “more than half of all e-commerce sites on the internet can use Facebook’s most advanced ad products without having to know code,” according to Andrew Biggs, direct response product marketing manager at Facebook. Do you sell products on your website via WooCommerce? How much does this integration help you?